The German Lebensreform (life-reform) movement sought alternatives to the social and economic changes brought about by rapid industrialization and urbanization in Germany during the nineteenth century. Lebensreform attempted to bring people closer to nature by promoting a vegetarian diet, eschewing physically constricting clothing styles (some advocated nudism), and even abandoning Judeo-Christian religion in favor of a spirituality that revered nature and the human spirit as part of the natural order. In some instances, this nineteenth century veneration of nature led to an affinity for the “blood and soil” (Blut und Boden) ideology adopted by the National Socialists in the twentieth century. The artist Fidus (born Hugo Höppener, 1868-1948), who drew the architectural blueprints for the “Temple of the Earth” shown here, became a member of the Nazi party in 1932. However, despite Fidus’ enthusiasm for the National Socialist’s ideology, his petitions to the Nazis for financial support to build his temples were rejected, and the sale of his work was banned by 1937. The “Temple of the Earth” laid out in this drawing epitomizes the turn towards the worship of the natural world and the human spirit. Fidus was a follower of the religious philosophy known as Theosophy, and his work is often associated with mysticism and nature-worship, an association to which this blueprint attests. The temple’s entrance guides a visitor either left or right – according to the blueprint, a female image would be located to the left of the entrance space and a male image would be located to the right. The halls surrounding the central space are dedicated to different human emotions and are assigned a corresponding color. The halls on the left of the temple are (bottom to top): Hall of Lust – orange light; Hall of the Emotions – predominantly red light; and Hall of Longing/Aspiration – violet light. The halls on the right of the temple are (bottom to top): Hall of Ambition – yellow-green light; Hall of Will – predominantly green light; and Hall of Love – blue-green light. Either path leads to the Hall of Surrender, lit with predominantly blue light, through which the central area, containing a fountain labeled “The Waters – Image of the Lord of the Earth” (Die Wasser – Bild des Herrn der Erde), is reached. Above the Hall of Surrender lies the Chamber of Silence, which is lit in dark blue. Through the Chamber of Silence, one would pass through “The Darkness” (Das Dunkle) before reaching the only circular space in the temple, the Sanctuary (Heiligtum). A water-filled trench (Graben) surrounds the temple structure, which is located in a “sacred grove” (Heiliger Hain). 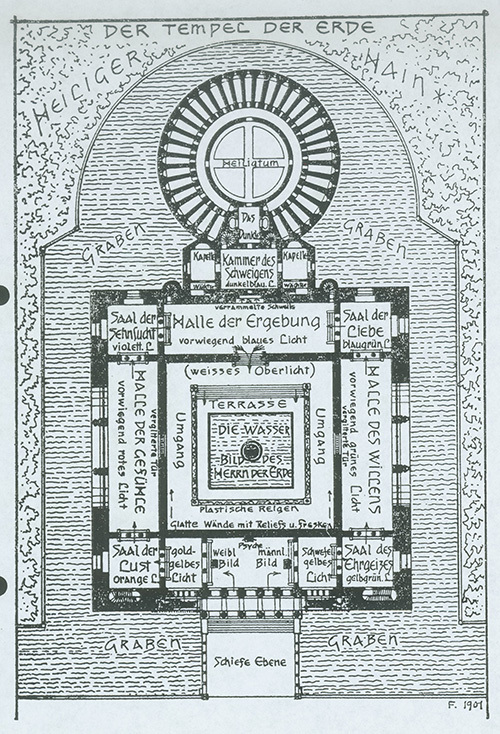 Source: Fidus, Tempel der Erde [Temple of Earth] (1901); reprinted in Jost Hermand, Der Schein des schönen Lebens: Studien zur Jahrhundertwende. Frankfurt am Main, 1972, p. 93.